State Sen. Leah Vukmir (R-Brookfield) is out with her first ad of her U.S. Senate campaign, and the best that can be said about it is that the gun on the table wasn’t a tuba. Then you see Vukmir in the same gray lighting and ominous music, sitting at a table with large, holstered gun on it. The camera comes in closer with the same gray lighting and scary music. With unintended irony, the ad the answering machine beeps as if another threatening message was about to be played. Or was Vukmir’s message the threat? This may be one of the worst political ads in recent Wisconsin history. The lighting makes Vukmir’s dining room look like a movie set in a remake of The Omen. The use of the gray lighting and the scary music is for when a campaign is showing the opponent, not your own candidate. 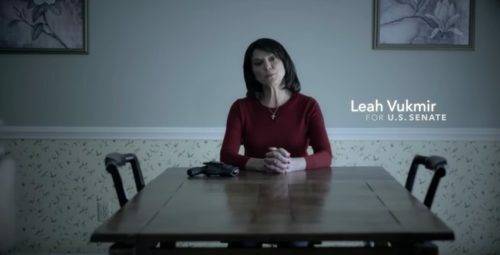 Vukmir campaign says the gun, which is in a holster, is Vukmir’s.
.@LeahVukmir spokesman says the voicemail in the ad is meant to be representative of threats she has received, but is not an exact copy of any one threat. You’ll notice the story shifted. If you don’t have the full story behind the audio you used straightened out, perhaps it would be better to use the actual text of an actual threat. Instead, the campaign’s response raises doubts about the ad’s accuracy. Then there’s the throwaway reference to President Donald Trump. The sentence doesn’t even follow the previous one, as if it was inserted at random. Is Vukmir saying that when she gets to Washington, she and Trump will drive the Left to more threats? Drive them crazy? Accomplish what she and Governor Scott Walker did in Wisconsin? Appear in a gray ad with scary music? Finally, the gun. To borrow a line from Jimi Hendrix, where is Vukmir going with that gun in her ad? As Anton Checkov said, if you introduce the gun in the first act, it needs to be fired by the third act. At the end of the ad, we’re left waiting for the gun to be fired, or at least explained. Is it just there to make Vukmir look more scary in the gray lighting and the scary music? Is she going to shoot the person who threatened her? Did she buy it for self-protection? The only things missing were a noose and a Bible so she could look like Judge Roy Bean. 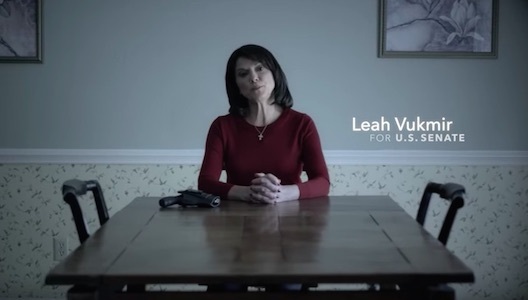 Vukmir is going to get a disproportionate amount of negative attention because of the gun in the ad introducing “scary Vukmir” to Wisconsinites. This isn’t the first ad to show a candidate with a gun. However, there’s usually a purpose other than trying to make a woman candidate appear menacing on the screen. I’ve had people try to defend this ad online, but yes, it’s really that bad. Some have even called the ad, “subtle,” even pointing to the crucifix Vukmir is wearing, which is really the fashion accessory that goes with the subtle big gun on the table. I know because I’m a big fan of The Sopranos. The only time someone intentionally tries to cram that much into one ad is when there won’t be enough money for a second ad. If that’s the case, then cue the scary music again because what happens between now and August 14 won’t be pretty. If the point of the ad was supposed to be about the threats and how Vukmir won’t be intimidated, then use actual threats, or at least newspaper headlines from the Act 10 protests that mention the threats to legislators. Show the protesters. Use the scary images of them with gray lighting and scary music. Show them occupying the Capitol and ominously surrounding Rep. Glenn Grothman (R-WI06) who was a state senator at the time. But if Vukmir really wants to be effective with her advertising, she needs to talk about how the policies she supported have benefitted Wisconsinites. 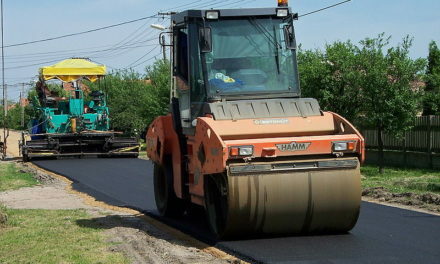 Let’s talk about lower taxes, including lower property taxes. Let’s talk about how Vukmir fought to lower drug prices for seniors by eliminating the minimum markup on prescription drugs, bucking the leadership of her own party (a two-fer). In other words, Vukmir should be trying to win an election. It’s effective, it has the right tone, and it shows how Walker is dealing with issues that matter to Wisconsinites on a personal level. What the Vukmir campaign really needs to ask themselves, is this all about attracting attention to the work of the political consultants, or is this campaign about getting Vukmir elected? The campaign seems more about getting attention by attempting to be “edgy” than by being effective. This ad was a complete misfire.